FARMINGTON — Holly Harrington, head coach of the Mt. 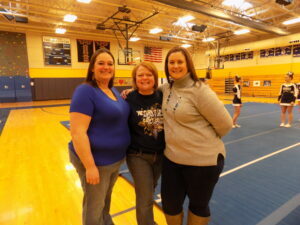 Blue High School cheerleading squad, is retiring after 25 years with the program. On Sunday, the Mt. Blue Rec Cheering exhibition held at the high school was dedicated to Harrington. Shannon Chase Smith started the rec cheering program. Harrington got involved in 2006 when the competition program started. Five years ago she stepped down as its head. Barbara Walsh and Robin Palmer-Mosher have been co-directors of the Mt. Blue Rec Cheering Board since then. They reached out to alumni who had cheered under Harrington to have as many as possible present on Sunday. Two dozen were on hand, including one from 1996, to present Harrington with flowers and hugs. “Holly has never not been involved. She’s always in the background. We go to her when we need help,” Walsh said. Walsh estimates 12-20 youth participate each year on the various teams. “Four students she coached have gone on to be coaches. I hear her words coming out of their mouths,” she said. Harrington said the sport has evolved since she first began. “Mats are used now. We’ve come so far stunting, tumbling, difficulty wise. Mt. Blue made it to states, got the Sportsmanship Banner the last three years. The Mt. Blue Rec Cheering is about much more than competing. This year the teams have participated in a charity event and a safety event. “The goal is for kids to know more than just competition. What they do outside is just as important. 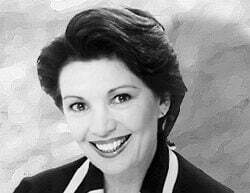 That started with Holly,” Walsh said. “I’ll always be around to support the kids, coaches. I’m thinking about going into judging,” Harrington said. She will have to complete a year of practice rounds first and wait until her current high school students graduate. Mt. Blue High School cheerleader Autumn Conklin sang the Star Spangled Banner. Coaches for each team were recognized. Before each team took the mat, the team members’ names were announced. Mt. Blue Rec Cheering has added a new, younger team this year. The Twinkling Stars are students age two and three. Coached by Abby McCarthy, Miranda Mitton and Kaitlyn Polk the team consists of Hope Pinkham, Aaliyah Merrill-Virgin, Abigail Clark, Kaydance Marsden, Lily-Blossom Floyd, Alyssa Scott, Harper Lake and Madelyn Somes. Rising Stars, pre-Kindergarten to grade two. are coached by Kaitlyn Polk and Emily Duion. Members are Adelynn Haskell, Alayna Chick, Mackenzi Lovejoy, Peyton Burnham, Winter-Storm Robinson, Sophia Felt, Adelyn Brackley-Burnham, Remi-Lynn Boyd, Airyca Beedy, Layla Welch, Autumn Embleton, Brooklynn Demillo, Arianna Palmer and Kylie Cochran. Shooting Stars, grade two to four, are coached by Abby McCarthy and Miranda Mitton. Members are Mattie Barker, Isabella Campbell, Jewell Marsden, Koralee Long-Flagg, Madison Martin, Grace Mooar, Hailey Farrens, Naveah Palmer, Destiny Blais, Kayla Reed, Ashley Akers, Caitlynn Cassidy, Jayson Foss, Isabel Harnden, Paityn Dusoe, Abby Walker and Daniel Lane. Shining Stars, grade five and six, are coached by Zanda Lewis, Emily Walsh and junior coaches Ally Walsh and Jade Lewis. Members are Naomi Lane, Haylee Downing, Alexis Wood, Avery Oliver, Kallee Foss, Leah Dill, Madyson Whitney, Anglee Brewer, Hailey Arsenault, Emma Turcotte, Ava Curtis, Alyssa Lane and Ayda Menangas. Super Stars, grade seven and eight, are coached by Nicole Osborne, Lexi Howard and junior coach Kate Pond. Members are Janessa Whitney, Morgan Mosher, Vicktoria Walsh, Madelyn Keller, Tianna Blanchard, McKella Ford, Katie Conant, Lexus Whitney, Madissynn Sutton, Mariah Dill, Kahlyn Wilkinson and Olivia Umbro. Mt. 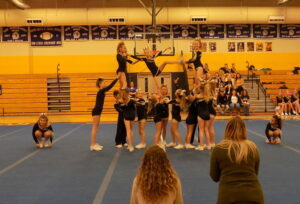 Blue High School cheerleaders are coached by Holly Harrington, assisted by Angela Whelpley and Jessica Baker. Members are Autumn Conklin, Josie Damren, Lauren Gould, Valerie Jackson, Jenny Kerr, Lauren Pinkham, Kate Pond, Miriam Sinclair, Valerianne Hinkley, Morgon Ashli Macomber, Sylvia Williamson, Tricia Souther Bowering, Cassidy Starks, Allyson Welch, Haley Walsh, Jade Lewis and Alaina Wilkins. Mt. Blue Rec Cheering has participated in two other events this year. One was a charity event, the other a safety program. Their first competition will be next Sunday in Augusta. Mt. Blue Rec Cheering will host a competition at Mt. Blue High School on Sunday, February 17. 24 teams will be competing.